Johns Hopkins Neurovirologist Richard T. Johnson has died, and his obituary at Hub provides a good summary of his career. He had an important influence on my work early in my career. 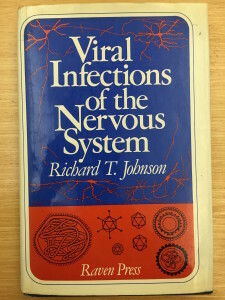 The first edition of Dr. Johnson’s book, Viral Infections of the Nervous System, was published in 1982 – the year I began my laboratory at Columbia University. 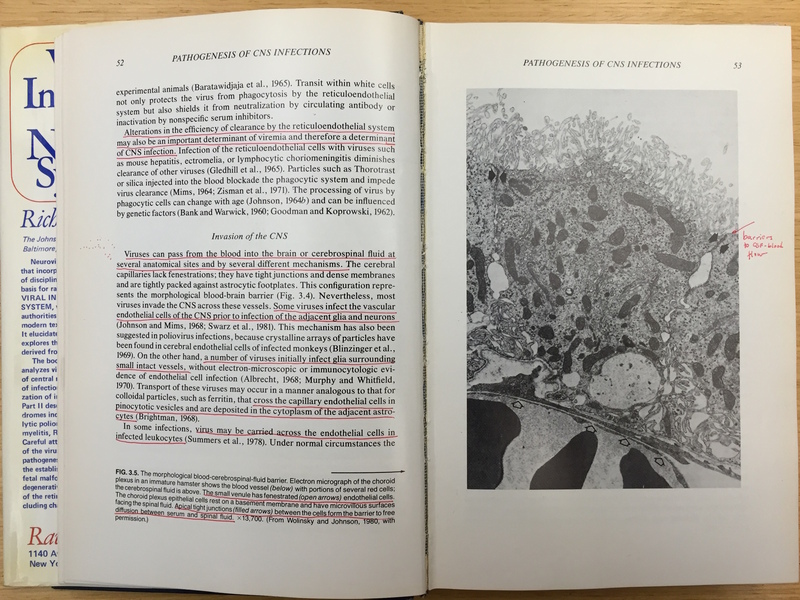 I was interested in studying poliovirus pathogenesis, so I immediately purchased the book (which I still have to this day – that’s a photo of it in the upper left). It served as an important resource and source of inspiration for many years, whether for writing grants, review articles, or thinking about viruses and their interaction with the central nervous system. I always liked his sentence on page 5, under ‘Origins of Virology’: Virology as a discipline began in botany, not in medicine. 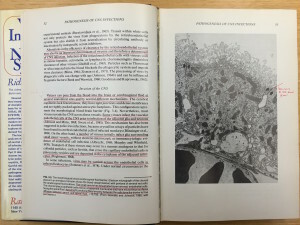 For me the most valuable chapter was ‘Pathogenesis of CNS Infections’ in which Johnson discussed how viruses move into and within that system. Many of the pages in that chapter are underlined and marked with comments (see photo below). Years later, when I was writing Principles of Virology, many of the concepts that I learned from Dr. Johnson made their way into that book. Dr. Johnson supplied me with an electron micrograph of the blood-brain barrier for use in our textbook. A testimony to the value of this book for me is how many questions it raised, rather than answered. It truly influenced my thinking about poliovirus pathogenesis, for which I am very grateful to Dr. Johnson. I used to do this all the time. Now I mostly read digital books, but I still use the editing tools available to mark up the manuscripts. I have a copy of Arrowsmith, which my Mother used to teach in high school english, and it is completely marked up in pencil. Precious. My beef is that, modern paper is so bad, that pencils either tear it, skid over it, or just leave powdery smudges; biros mark right through to the page beneath, and stick to the facing page; and liquid ink gets spread out like blotting paper! For a time I used to use very fine Rotring pens, but the fillers in the paper blocked them up too quickly. An old fashioned dip-in mapping pen and India ink proved best, despite all the modern inventions, but this is no good as a marker to use anywhere. Still room for innovation! I have an old 19C flora, which still has clear white pages, and handy marginalia, and also has newspaper clippings in it, of reports tracking the voyage of the Beagle. Even the newspaper clippings still have not gone yellow or stained the book’s paper! On the other hand: last week, my email programme updated itself, and wiped the message body from several thousand emails, that were my main records of what I’ve been doing for the last 4 years. I wonder if future generations are going to end up back in the Dark Ages thanks to the move away from good old paper? !